Mountain Road Productions is gearing up for a bustling winter of production after having recently received two new series green lights with HGTV Canada and Cottage Life. 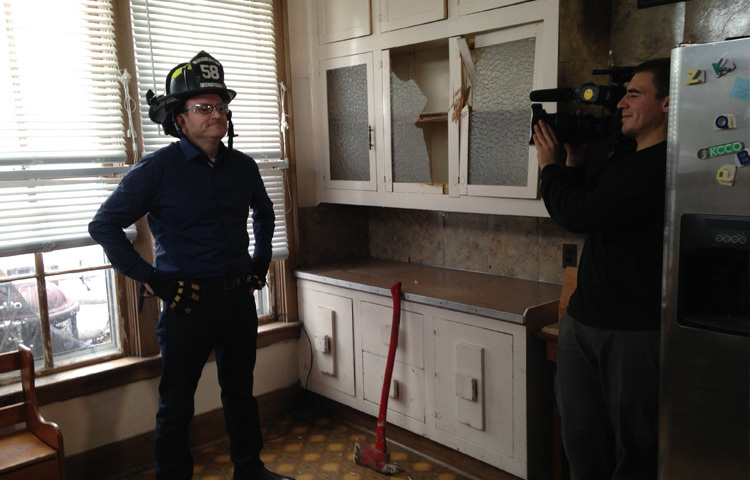 I Wrecked My House, which aired as a one-hour special this past April has been picked up by HGTV Canada for 14 new half-hour episodes. The series takes a humorous look at homeownership with host and comedian Steve Patterson witnessing the country’s weirdest home repairs and over-the-top jerry-rigged fixes as he searches for Canada’s worst homeowners. Production for the series began November 7 with episodes slated to air in spring 2015. Also on the calendar to begin production this fall is Master My Disaster (working title) a new 13-episode Cottage Life series that dives into the world of cottage renovation projects gone wrong. Each episode top notch contractor Dave Depencier and his team turn disaster renos into a little piece of cottage perfection. Along the way they right the wrongs and teach cottage DIYers how to do things right. Episodes are also set to begin airing spring 2015. Mountain Road is also finishing up post-production on Real or Fake? for National Geographic Kids. This fast paced and hilarious webseries has four teenage hosts known as “Seekers” who are on a mission to find the smartest people on the block. The fun, funky and downright crazy Seekers ambush the unsuspecting public with a series of REAL or FAKE questions, and the brainiest of the bunch ends up winning a prize in the final round. The 10 webisodes are currently in post-production and will soon be available online at natgeo.com/kids. In addition to these exciting new projects, Mountain Road recently completed production on the second season of Selling Big for Cottage Life and is now wrapping up post-production. After a successful first season last fall on Cottage Life, Selling Big, which follows Ritchie Bros. Auctioneers – the world’s largest auctioneer of heavy equipment and trucks – is back on air for a second season of tighter timelines, higher stakes and even bigger iron! New episodes of the series are currently airing Wednesdays at 10pm ET/PT on Cottage Life. The series aired in the U.S. as a 1-Hour Special on Destination America earlier in the year and has been distributed internationally to over 35 countries around the world including the UK, Australia, Italy, Russia, Norway and Sweden.